I hope you all had a great week and are ready to tangle.... let's get right to it and make this week short and sweet! I just wanted to say a HUGE thank you for those of you who participated in last week's Moebius Syndrome Awareness Challenge, and to everyone who wore purple in support of Artoo and our family!! Thank you so much!!! i've been aware of this tangle for a while, as the CZTs get a bit of head start on official tangles. I've yet to master it, as well i've yet to master the new Renaissance Tiles.... but i have to say i'm kinda happy with how my tile turned out. The challenge is to try out the new tangle! I so love your tile! I am intrigued by your use of color in the past two challenges! Your family is amazing! Thanks for all you do for us! A beautiful tile Laura, and a fantastic picture of your family! It really made me smile. Great piece of artwork in the background too! Love to see you and your family so happy :) Makes me smile every time. That tangle really was fun. Aquafleur is a beautiful tangle and I tried to set it up like a underwater flower with waving petals. Great family photo, and beautiful tile! Did you do the art on the wall behind you in the pic? Very colorful piece! thank you! i wish i made the piece behind me. it's by Alex Grey and the piece is called "Net of Being"
OOPs - the entry with (owls) in brackets should be deleted! Sorry about that, Laura. The entry above that is the one that should be there! Thanks for the Challenge I have been meaning to try this pattern but just haven't got around to it. So thanks! Oh, btw, your link just above the comments that says: "Learn more about The Diva's Weekly Zentangle Challenge here." doesn't really lead anywhere... Thought I could put a link to that page on my blog for people who don't know about the challenge. 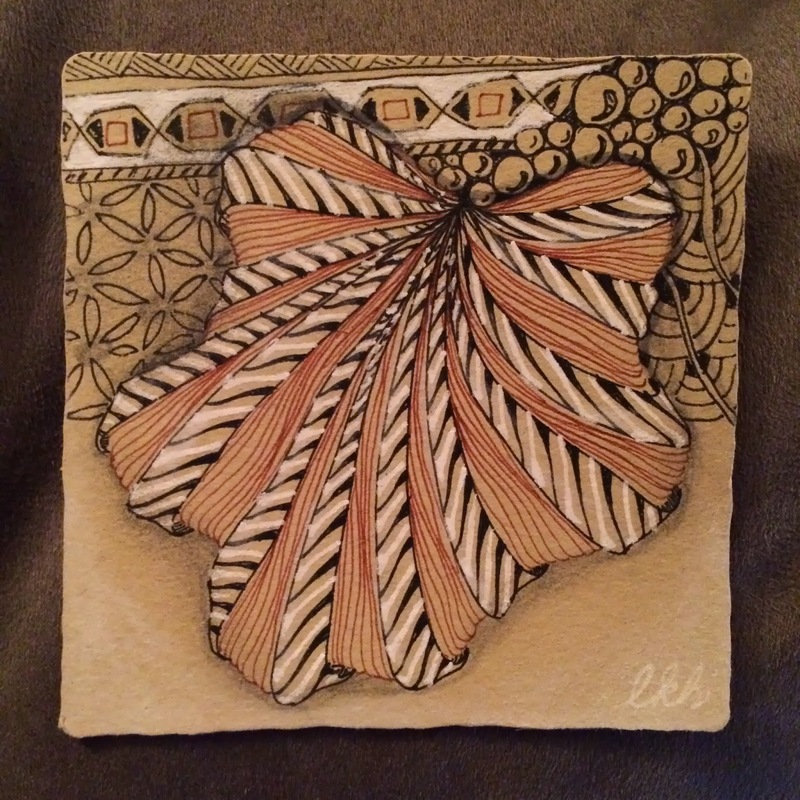 Learn more about The Diva's Weekly Zentangle Challenge here. I accidently added my Challenge Week #2 to the wrong one,I am sorry, I thought it was going to #2. Laura, thanks for this challenge. I really love Aquafleur, and this gave me a chance to play around with it some more. Love the picture of all of you; it imparts such a sense of fun and family. Keep up the good work. Just submitted my first ever tile for the challenges. Thank you for providing them! So many inspiring works each week. I just looked at all the tiles up til mine, and now I'm out of time. I just wanted to say to everyone...WOW! this is a striking pattern. I didn't love it at first, but it's much more versatile than I thought. It is worth some trial. I love Aquafleur! This is only my 2nd time to play with the Diva but I am going to make a real effort to try each challenge. Thank you for providing this means of practice our tangling! Happy to be back again - I was on vacation with the grandkids so I missed the last two. So glad to be back!!! Aquafleur is fun. Annette! i wish!! LOL the artist is Alex Grey and the piece is called "Net of Being"
Oh Aquafleur, how you make me think of warmer weather! FINALLY finished this. Used a watercolor wash (I guess the name of the tangle inspired me to). Hope you like it! I just heard about your site from a friend who participated in this challenge. I am a newbie at Zentangle, but decided to try Aquafleur out today. This is such a great tangle; it will definitely take a little time to master but can be used in so many ways! Gorgeous tile, by the way, and loved seeing everyone's version of it.